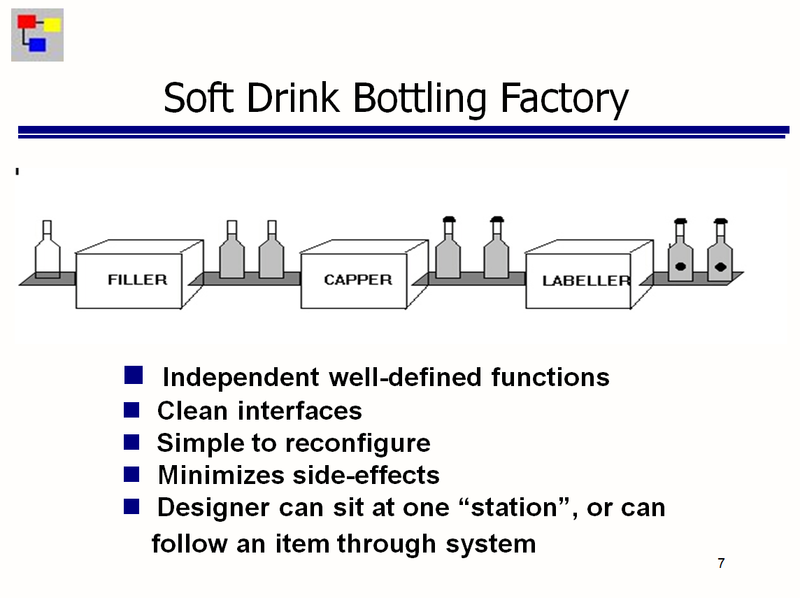 In computer programming, Flow-Based Programming (FBP) is a programming paradigm, discovered/invented by J. Paul Rodker Morrison in the late '60s, that uses a "data processing factory" metaphor for designing and building applications. 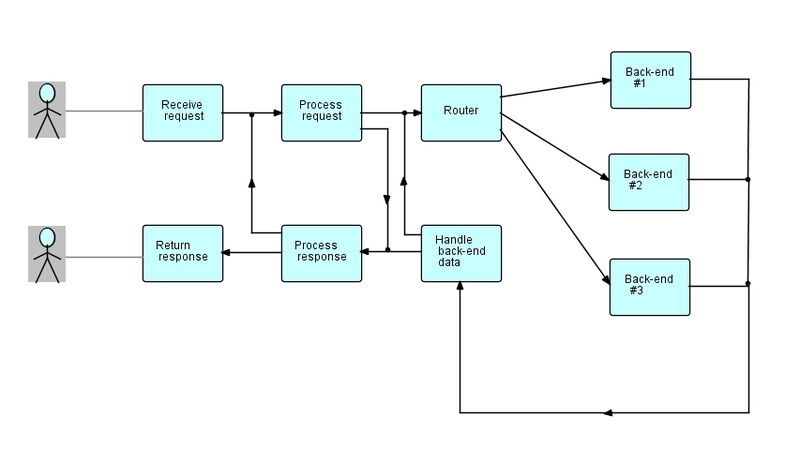 FBP defines applications as networks of "black box" processes, which communicate via data chunks (called Information Packets) travelling across predefined connections (think "conveyor belts"), where the connections are specified externally to the processes. These black box processes can be reconnected endlessly to form different applications without having to be changed internally. FBP is thus naturally component-oriented. FBP is a special case of dataflow programming characterized by asynchronous, concurrent processes "under the covers", Information Packets with defined lifetimes, named ports, "bounded buffer" connections, and definition of connections external to the components - it has been found to support improved development time and maintainability, reusability, rapid prototyping, simulation, improved performance, and good communication among developers, maintenance staff, users, systems people, and management - not to mention that FBP naturally takes advantage of multiple cores... without the programmer having to struggle with the intricacies of multitasking! FBP is described in J. Paul Morrison's book "Flow-Based Programming: A New Approach to Application Development", now in its 2nd edition, which can be obtained in paperback form from Amazon, or in 2 e-book formats: Kindle and epub. Further down on this web page you will find a bunch of useful links, including a list of currently supported programming languages (on GitHub), and some videos demonstrating the use of the FBP diagramming tool, DrawFBP. During FBP's early days, networks were coded by hand, and initially we used pencil and paper, followed by more sophisticated graphical tools, whether or not they played well with FBP software. However, with the advent of good graphical support, we now have a powerful graphical tool (DrawFBP), and in recent years the emphasis has been shifting to doing the diagramming on-line, and then generating the networks (we can see this progression with other flow tools on the market). Now that compile and run functions have been added to DrawFBP, the developer can do much of the development graphically, and on-line. If you have come across Flow-Based Programming by way of NoFlo or Flowhub, it is recommended that you read FBP vs. FBP-inspired Systems, which attempts to highlight the differences and similarities between FBP proper, or "classical" FBP, (the subject of this web site) on the one hand, and NoFlo and other similar FBP-inspired systems on the other. FBP does involve a significant paradigm shift for the majority of programmers, which may be why a number of systems such as NoFlo have appeared in recent years that appear to be a halfway house between FBP and conventional programming. While the FBP paradigm shift may cause some trouble at first, given the prevalence of the older programming approaches, in fact it embodies a simple mental model (not "simple" as in easy but "simple" as in elegant, to quote Joe Witt), and has proven over several decades to result in applications that are more understandable and maintainable than those built using the conventional (von Neumann) paradigm. For those of you who do not have the patience to wade through the whole book (TL;DR! ), I would strongly advise reading at least Chapter 3, Basic Concepts, as this describes the fundamental concepts of FBP. This chapter will answer many of your basic questions about FBP, and act as a starting point if you wish to dig deeper. We know you are tired of Powerpoint presentations, but this one (from 2007) gives quite a good overview of FBP - as it was at that time. There is also a video (not very professional, I'm afraid! ), where I present this at a Meetup in Toronto in Sept. 2013 organized by Paul Tarvydas, CEO of Tarvydas-Sanford Controls Inc., and Dann Toliver. It has a few jokes and reminiscences, and may be more accessible than the straight Powerpoint presentation! The Paul referred to in the video is Paul Tarvydas. Towards the end (at 40:12) there is a brief demo of the FBP diagramming tool, DrawFBP. FBP on GitHub: The implementations listed above under "Software"